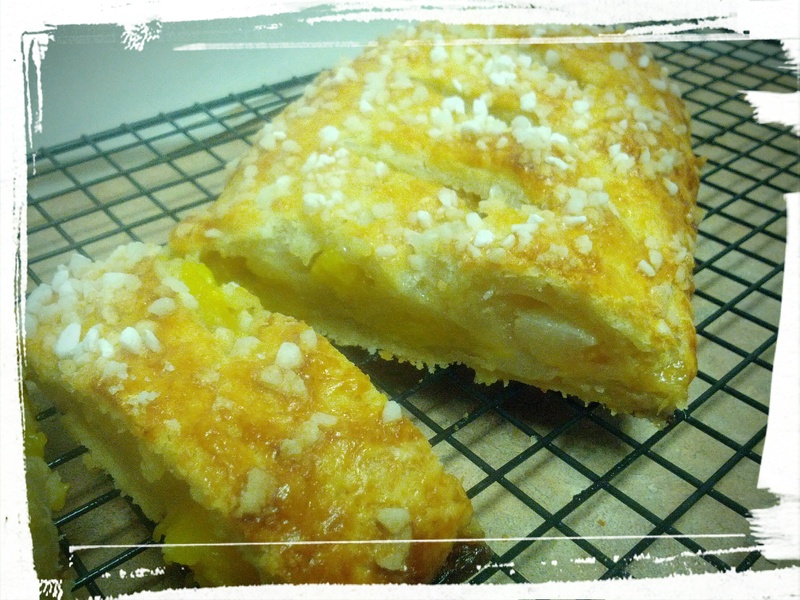 Flaky and fragrant and nom nom nom! Do you ever rush home after work and try to run around pulling dinner together? I really can’t be bothered, to be honest. Aside from the fact that I eat yoghurt for dinner, I’m not going to stress about dinner for the DH. I’ll make it the night before! (Or he can make it himself. *grin*) And when I cook, I tend to do more than one dish; I like to spin all the plates at the same time! Turn up all the burners! Use all the mixing bowls! (Not so much do all the dishes, but needs must.) Tonight was one of those nights. The Cranberry-Pear Roll-Up Tart is a strudel by any other name. Ish. 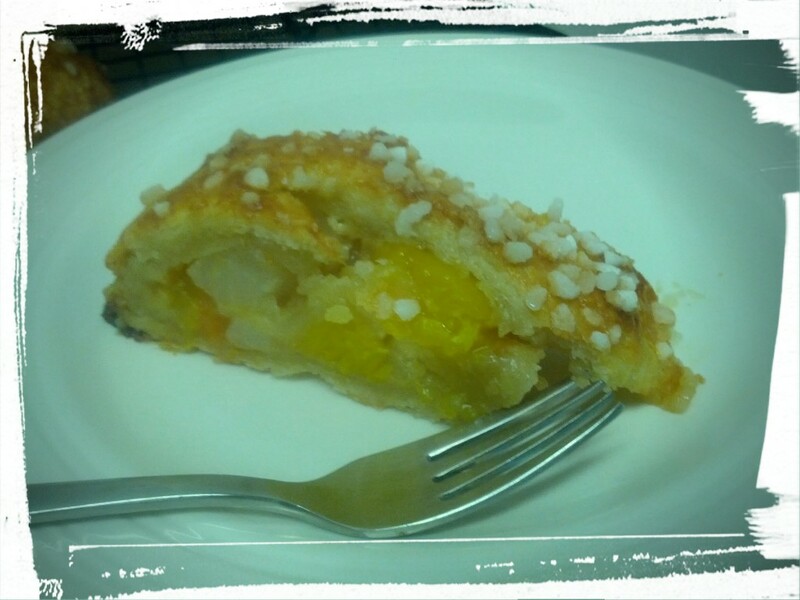 Basically, as opposed to a thin and flaky pastry as in a strudel, one uses a pie crust. And in my case, as opposed to cranberries, one uses chopped mangos. And the odd chunk of cantaloupe. Mostly because I didn’t want to go shopping to buy a bag of cranberries, plus I felt the dried cranberries that I always have in my cupboards just didn’t appeal to me. And I had a ripe mango that was looking at me beseechingly. (The cantaloupe I threw in because I thought I wouldn’t have enough filling. I was wrong. So I added the leftover filling to my fruit salad for lunch tomorrow. #wastenot!) Dorie’s recipe calls for raspberry or strawberry jam, plus dried and fresh ginger. Me being me, I swapped out the raspberry jam for wine jelly. Again, partially because I had some lying around, and partially because I didn’t want to go shopping. Good enough to eat by itself (I confess to snacking as I baked). The verdict? Deeeelicious! 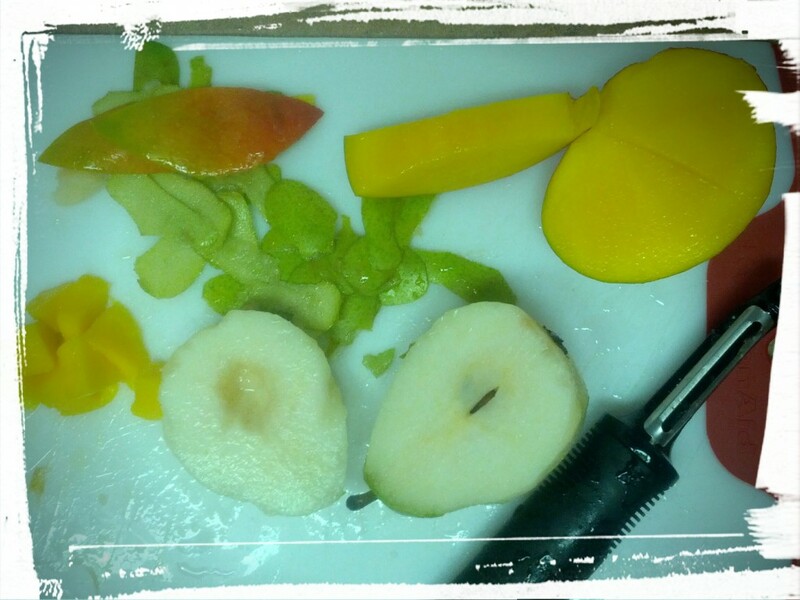 Although I have to say, the pear-mango fruit mixture was interesting with the ginger. My taste buds were a tad confused. Thanksgiving in the Caribbean is the best flavour description I can come up with. But it worked! The verdict from the DH? Which no, he cannot, because…it’s all gone! I packed it into our lunches and we each ate two slices tonight when it was warm out of the oven. Because it’s just so good! I’d definitely make it again. It’s something that would be nice to serve with coffee. Retro 70’s coffee klatsch, anyone? Yummy, yummy, get in my tummy! Next Post: Maybe the Grind-Your-Own Garam Masala that I’ve been teasing you all with lately. Or…maybe something else! We’ll see what I’m craving later on this week. This entry was posted in Cook-a-Longs R Us on November 25, 2015 by Margaret. Thanksgiving in the Caribbean sounds great. Using what you have on hand is a great idea. We enjoyed this one too.